There’s an old joke, what is invisible and smells like carrots? And the answer is, bunny farts! Considering the number of carrots he eats, I would think Dudley farts would also be an acceptable answer, but I’ve never really noticed the smell of carrots when Dudley is gassy, which is always. Then again, I’ve never really pondered the bouquet of Dudley’s flatulence, although sometimes one fart lasts for upwards of 15-20 seconds and I do find that impressive. I never pondered the aroma until the other night when I brought home Chinese food for supper. Dudley loves rice and I don’t much care for it, so he gets the bulk of what comes with the meal, just not all at once. I took a few spoonfuls for myself and put some in with his supper and when I went to put the carton in the refrigerator (conveniently located right beside his dining area) I dropped it. 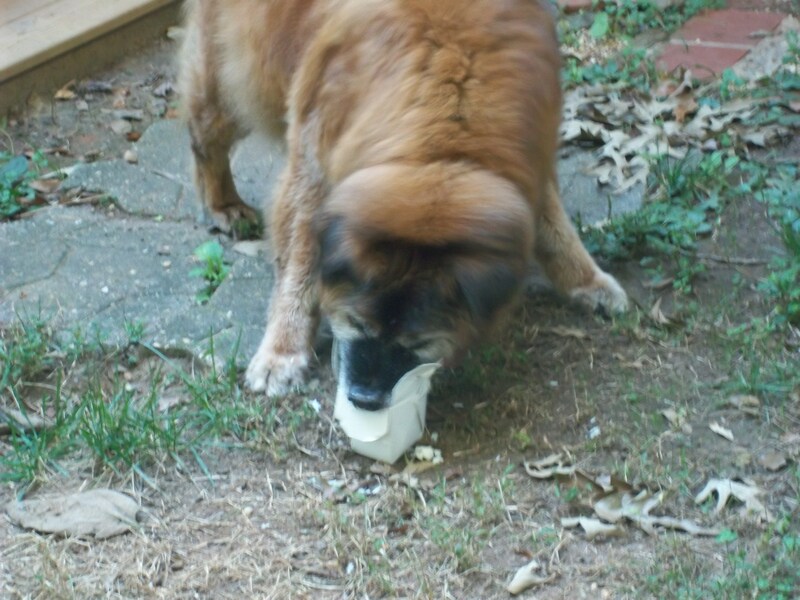 My 14 year old, cancer-stricken, deaf, arthritic dog with the gimp knee was out the door and down the steps with that carton of rice like a streak of lightning! He wasn’t letting me near that rice, so I grabbed the camera. He managed to open the carton and eat the rice on top half of the carton, but was having trouble getting to the rice in the bottom. 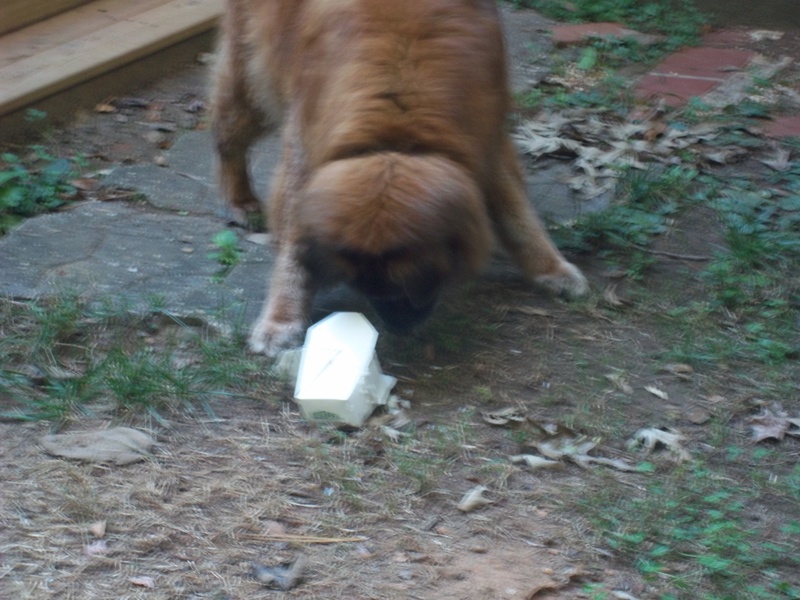 He saw me coming closer and grabbed the carton by the bottom and trotted off spilling rice through the yard. I did take a few pictures of the rice piles, but I was laughing so hard they were blurry. Fortunately, Dudley turned around and saw the rice piles and dropped the carton. I did want to get that away from him before he ate the wire handle. A few hours later he was snoozing in front of the couch and this odd smell wafts over to me, I knew it came from him but it smelled different than his usual “toots”. With his age and ailments, I do try and stay tuned to anything out of the ordinary, but then it hit me, there was the normal sulfury, swampy smell but with top notes of rice. This phenomenon lasted for about 12 hours and then I guess all traces of the rice were gone and he reverted to his normal, stinky farts. How do I get what’s in the bottom? Unless it is accompanied by diarrhea, or your dog acts as if he’s in pain, flatulence usually isn’t anything to worry about. Flatulence in dogs normally comes from gulping large amounts of air while gulping their food. One idea to reduce gas in dogs is to feed them 3 smaller meals each day instead of only 1 meal. I feed Dudley twice a day, but he still gulps his food. There is another old joke about a salesman with gas sitting at a table with a dog underneath. As he tries to sell his product, he lets some of his own gas slide out silently thinking the dog will get the blame. Sure enough, the dog’s owner keeps telling the dog to get out from under the table and the salesman continues to pass gas. Finally, the owner grabs the dog by the collar and pulls him out from under the table, “Rover, you need to get out from under the table before he poops all over you!” So much for being surreptitious. This entry was posted in Uncategorized and tagged animals, canine, canine arthritis, Chinese Food, dog flatulence, dogs, Dudley, Humor, rice, senior dogs. Bookmark the permalink. Thanks for the 411 on Dog Farts/Gas A super read we dog lovers can all identify with! Believe it or not, I actually miss those noxious fumes.